I used to live in Stourbridge, in fact we lived there just short of four years. It’s a nice enough town, right on the edge of the West Midlands conurbation. One of its benefits is that it is right on the edge of Worcestershire, and indeed Staffordshire, and the countryside is easily accessed. I have spoken about one golf club there where I took a short course of lessons but I never had the opportunity to actually play a round on the course, although it looked pretty nice. 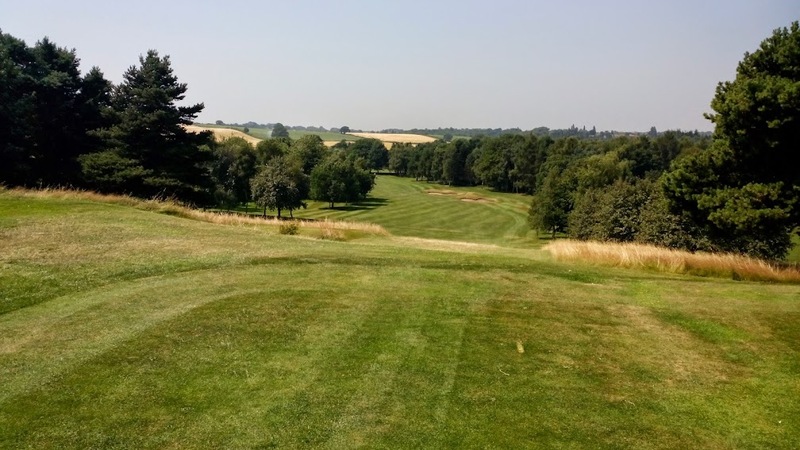 There is one course in the town I did however get out for 18 on – the eponymous Stourbridge Golf Club. When we lived in Stourbridge I was working in Birmingham and the further Midlands region and getting around by car. As you do, once I had lived in the town for a while I got to know wee back street routes to avoid rush hour bottlenecks. One such back road took me along the edges of the town and past the golf club. Way before I picked up the clubs again I often thought that it looked quite a nice course from the glimpses I caught as I drove past along Racecourse Lane. When I started playing again in June 2014 I first of all looked to local municipal courses – being from Ayrshire I remembered my brother having a really good season ticket deal which allowed him to play multiple different courses so I hoped I might find something similar. It didn’t turn out to be the case but at a tip from a mate I discovered the website teeofftimes.co.uk which allowed me to book local courses at reasonable prices. I kept hoping to find Stourbridge on there but it never seemed to turn up and I generally played at other, slightly further afield, courses – which I will also write about in time. £17? I’ll go for that! So, I booked it and the next day went along to play. It was nearly 30° and blazing sunshine. Perfect weather for golf, as long as I could keep myself dehydrated. The staff who greeted me and sorted me out was super friendly – he told me that another single player was just about to start and rushed off to see if I could join them. He came back a minute or two later to inform me that the other player had already teed off and I would need to play by myself. He was almost apologetic! I assured him that was absolutely fine as I was still very much a beginner and quite happy to play alone so that I could take my time without any pressure. He took me out to the tee off and explained the lay of the course. According to their website, the club had recently changed the layout of the course but of course it made no difference to me as this would be my first (and to date only) round there. Luckily my slice didn’t kick in on that hole and my tee shot didn’t find either of the bunkers on the right! In addition to overlapping fairways there are a number of shared tee boxes! On the 3rd I think it was I was looking a bit lost trying to figure out which fairway to play and a kind local pointed me to the right one. In fact, that was a theme of my visit – friendly locals who all welcomed me to the club. If you like parkland courses then this is a cracker! If we were still living in Stourbridge I would seriously be trying to figure out how to afford to become a member. According to the club’s website it is built on sandy soil and thus has good drainage and is playable all year round. If that is the case then it would definitely be worth joining. 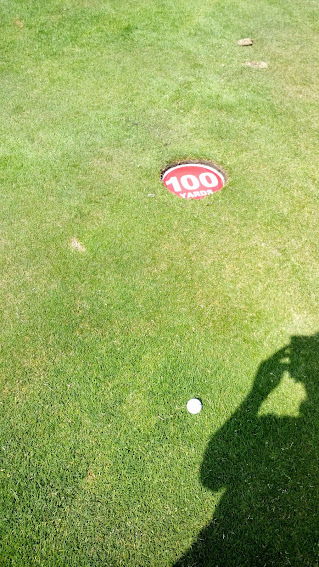 I had given myself a target for the round of 100 (I had yet to to get near this on the rounds I had played in the preceding weeks) and I made the fatal error of checking my score before the par 4 18th and saw that I was on 96. I had just parred the 17th so the thought struck me that if I could repeat that and par the 18th as well I would make my target… The 18th is 353 and I struck a beauty of a drive. As I walked up to the ball sitting in the middle of the fairway I was trying to figure out how far I was from the flag. I needn’t have bothered. I could do this- it was within my grasp! Of course, I scuffed my approach shot and needed a third to get on the green and then three putted for 6 and a round of 102. Thumbs down for my performance (although 102 still ranked a season best at that point) but thumbs up for Stourbridge Golf Club. I hope I can play again at some point when I definitely will break 100!